Usage data statistics are a valuable metric to researchers, second only to citations. Unlike other altmetrics providers, Plum Analytics has long included usage statistics as an important category of altmetrics. Now, research usage data for one of the largest Chinese e-journals content collections is available through the PlumX altmetrics suite. PlumX users can now see and analyze Airiti usage data from thousands of universities, documenting how many times content has been accessed or downloaded. This window begins to capture research interaction as soon as research is published, years ahead of citations and showing interest well beyond online attention and social media. Additionally, some types of research which don’t typically see a high volume of citations or social media interactions, such as theses, can now be measured and analyzed by usage. As we add new collections of regional content like the Airiti e-content and usage metrics, it has been fascinating to see how local content from around the world fits together to tell the story of how a piece of research is being used globally. For example, the PlumX Artifact Page below highlights e-content from the Airiti corpus: a review article published in the Asia Pacific Journal of Clinical Nutrition. 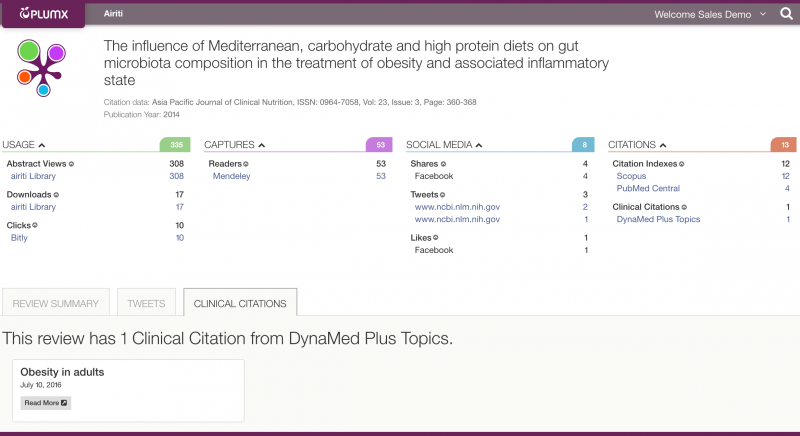 Along with metrics for Airiti Abstract Views and Downloads, users can also see Twitter interactions in Spanish and English, while PlumX’s clinical citations highlight that this article informed DynaMed’s clinical practice guidelines on treating obesity. This review article from Airiti has diverse altmetrics data including usage, captures, social media and citations from several sources – including a DynaMed clinical citation. This historic implementation will continue to evolve as new functionality comes online. Citation metrics from Airiti’s own Academic Citation Index (ACI), a Chinese Humanity citation index covering both the Taiwan Humanities Citation Index and the Taiwan Social Science Citation Index, will soon be available in PlumX. Tom Crosby is content and digital marketing manager for Plum Analytics.